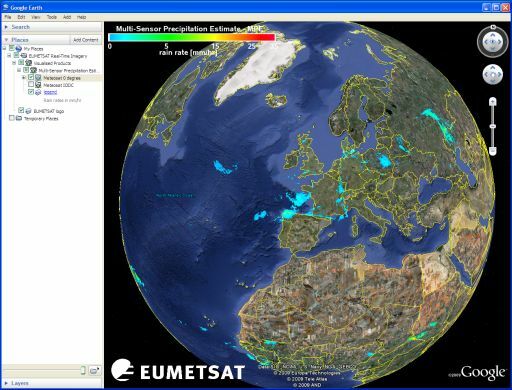 A selection of EUMETSAT's visualised products are available in .kml or .kmz formatting. These are geolocated and can be easily displayed using Google Earth. Using the Google Earth framework, images are automatically refreshed when more recent data become available. The refresh rate differs depending upon the visualised product/RGB in use. The table below provides the refresh rate for the currently available products. Download and install Google Earth on your system. Select the layers you want to view. From the Sidebar > Places, select EUMETSAT Real-Time Imagery.